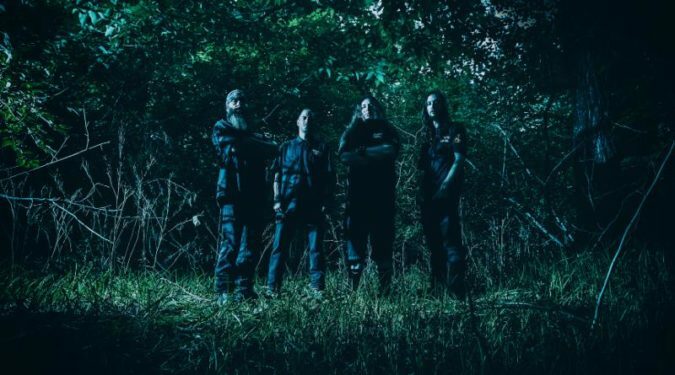 Maryland blackened thrash / crust ‘n roll outfit THONIAN HORDE confirm the release of their third album, ‘Downfall‘, is set for May 24th via Grimoire Records. Formed in 2016, THONIAN HORDE unites a veritable Who’s Who of players from a genre-crossing swath drawn from the Maryland musical underground. Together, bassist and vocalist Ron “Fezzy” McGinnis (Pale Divine, Admiral Browning), drummer Tyler “The Beast” Lee (Weed Is Weed), and guitarists Darren “Dirty” Waters (Weed Is Weed) and Dan “D-Mize” Mize (Faith In Jane), render utterly savage, abrasive metal to the masses. In 2016, the band issued their introductory, eponymous titled album, quickly establishing themselves as a most volatile recording act. This was reinforced by means of THONIAN HORDE‘s live insurrections onstage, their sinister discharges of apocalyptic metal winning over fans with each show. ‘Inconnu‘, their second studio album, arrived in 2017, from Grimoire Records and now the occult-driven quartet return with their most abhorrent album yet. ‘Downfall‘ reunites several of the integral ingredients from the ‘Inconnu’ record, with tracking once again done mostly live in the Grimoire Studio with label head Noel Mueller, with minimal overdubbing. The cover art was created by the returning Gilbert Miranda for Lingua Mortis Artwork, and the CD layout was finished by Mueller. ‘Downfall‘ will be released via limited edition CD and digital download on May 24th through Grimoire Records; find pre-order active now at this LINK. Audio samples, song premieres, and other actions are expected to arrive in the weeks ahead.